This article examines several such legends and discusses their reality. But first, a disclaimer: The “reality” portions that follow are based solely upon the unscientific experience of the author, with no empirical evidence other than nearly 25 years of practicing law. Urban Legend: Men Don’t Get Custody. Reality: In the olden days, it was fairly routine that the wife got the kids and the husband got visitation every other weekend. 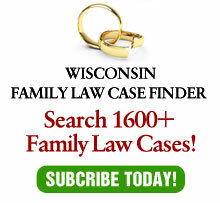 Besides the change in the nomenclature from “visitation” to “placement,” Wisconsin legislation has attempted to remedy this conception by requiring courts to be gender-neutral. Anecdotal evidence suggests that while men are far more likely to get equal or even primary placement — but the law cannot change biology. Courts, as they should, consider the historical parenting patterns. As biology requires women to bear children, they are also more likely to get primary placement than men if the children are younger. Where the children are older, this preference fades to nonexistence. Urban Legend: Men Don’t Get Maintenance. Reality: Traditionally, maintenance was a payment that men made to women. Again, the law is supposed to be gender neutral. For the same reasons as with custody, maintenance is still largely paid from men to women. In fact, lawyers frequently refer to the opposite as “reverse-maintenance cases”. The reason is not gender bias by the courts, but mostly the income differential that exists between men and women. Further, maintenance is frequently based on contributions to the earning capacity of the other spouse and sacrifices for the family. Since women are more likely to have maternity leaves than men are to have paternity leaves, it is more likely that the wife will have sacrificed earning capacity for the family and, by doing so, contributed to the husband’s earning capacity than the other way around. Another reason is more subtle: Some men simply don’t want maintenance, apparently finding it to be demeaning. Similarly, woman seem to hate paying it even more than men do. As a result, it tends to be negotiated away more often in the “reverse” cases than the “normal” ones. Urban Legend: Men Don’t Get Child Support. Reality: As with the first two urban legends, this theory is promulgated largely by “divorced dads” groups who see the legal system as gender-biased. And, as with the other gender-based legends, there is a certain amount of truth to this theory. But again, the reason is more based on fact than system bias. First, as with maintenance, there exists an income differential between the genders. However, unlike maintenance, the income differential is only part of the story. The court can award child support to the higher-income parent if that parent has the children the greater amount of time. But — and perhaps more importantly — many men trade off child support for custody/placement. Certainly, there are many cases where men do not say this and in those cases, child support should be — and usually is — paid from the female to the male. Urban Legend: Lawyers Conspire Against Their Clients. Reality: This is a common, albeit paranoid, view held by certain clients.The theory that lawyers put on a show for their clients, then settle the cases in such a manner to make sure they are paid, to the detriment of their clients. In reality, sometimes it would be better for clients if the lawyers could “conspire” to reach a settlement, although certainly not after needlessly running up fees. In any event, this legend is not very logical. For one thing, it is clients who approve settlements – lawyers only make recommendations. Second, when lawyers needlessly fight with each other, they might put on a good show for clients, but it is expensive and certainly not conducive to reaching a “win- win” settlement. Most cases have a finite limit as to how much the clients can pay. The truth is that lawyers, while frequently highly competitive with each other, are for the most part ethical and professional. Urban Legend: Most People Hide Assets When Going Through a Divorce. Reality: Of all the urban legends discussed in this article, this is the most difficult to test. For sure, divorce brings out the worst in people. People who would never think of shoplifting an item from a store at least think of – if not actually commit – fraud in their divorce. They rationalize their behavior by assuming that the spouse is doing likewise. A group of experienced lawyers, including the author, once got together to discussed the question of hidden assets. In cumulative, many years of divorce experience was present. In all of that experience, only a very few cases could be identified where hidden assets had ever been discovered. Perhaps this is because they are not easy to uncover. More likely, where there are “hidden” assets, they tend to be rather minor, such as an item of jewelry. For the large part, however, it is this author’s opinion that most people are inherently honest. While they might be tempted to be dishonest, in the final analysis, most people opt to do the right thing. Urban Legend: Courts Are a Good Place to Settle Disputes. Reality: While sometimes there is no alternative to litigation, this should always be a last resort, not a first one. Most judges simply don’t have the time to fully try all the issues involved in a family law case. Further, many issues, such as placement schedules, do not lend themselves well to an evidentiary structure. Finally, people can make compromises in settlement which can lead to a “win-win” result, as they both give up the lesser important issues in exchange for the more important ones. Too often, courts cannot discern between the more and lesser important issues and the results of the trial end up being “lose-lose”.